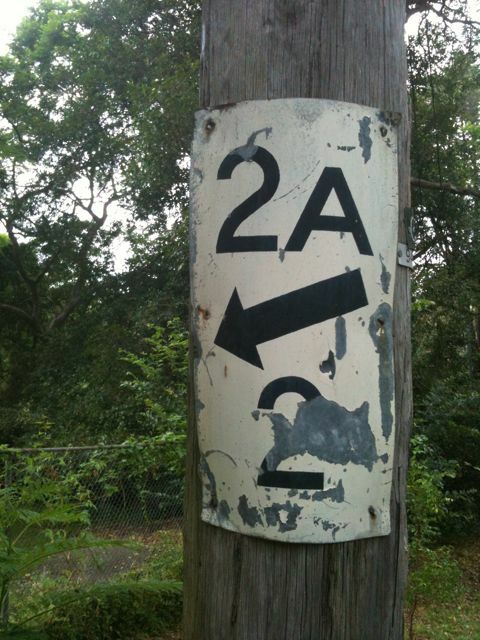 The Reluctant Sydneysider: Things that go bump in the day. As I explained in my last Reluctant Sydneysider posting I am used to Things That Go Bump in the Night here in the depths of the inner-city bush - be it marauding rats in the kitchen, possums pattering across the roof, or Sniff's rare but alarming habit of leaping up in the middle of the night and barking at some invisible (to us at any rate) enemy. But daytime in Greenwich also brings its fair share of disturbances. 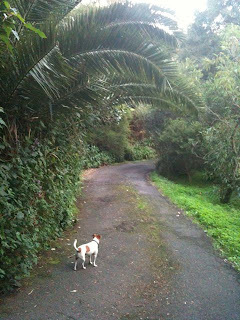 There are the man-made noises of building work and gardening which resonate up and down the creek, amplified somehow across the water; the early morning racket of the kookaburras and the currawongs carousing in the tree-tops; the raucous passings-by of flocks of cockatoos; the sound of torrential rain (we're having a wet time of it these days); the high lonesome tweets of the King Parrots; and, periodically, the loud shocking thud of a bird flying smack bang into our many windows. These birds are the Things That Go Bump in the Day. Last week I was negotiating the twists and turns of our driveway with a boot-full of groceries, returning home from Lane Cove (not the closest but probably our best local shopping). Locating our house for the first time involves a fair amount of intelligence and a modicum of derring-do because our private driveway is both difficult to find and in various states of decay. Once you've found it, usually by telephoning for directions having already got lost once or twice, you veer past our letterbox (which confusingly is right outside someone else's house) and head further down the increasingly delapidated track for the building on the right (the one on the left is much larger, posher and has a swimming pool...). Talking of letterboxes, I would like to say that the American-style mailboxes which everyone has here at the entrance to their driveways is something I like about Sydney and perhaps to go on to write a whole blog about Australia Post. But the truth is I find them rather alarming. 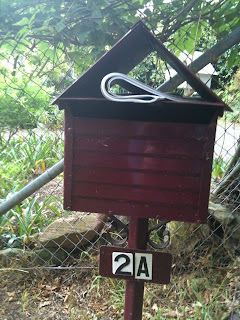 Although there is something lovely about having to trudge for three minutes up the drive to check to see if the post has arrived there is nothing lovely about the trudge back home having discovered it to be empty. Our postman is a lovely man. The other day I caught him dancing down the drive, headphones clamped to his head, so I asked him what he was listening to. The completely unexpected answer was that he was listening to The Danse Society - an obscure 80s British New Romantic band whose first (and perhaps only) album I happened to have bought, in St Albans, from the record shop in Marshalswick Quadrant, in 1981. This led to a conversation about the best electronic groups of the early 80s but the postie (to use the Australian vernacular) knew far more about the subject than I, citing demos, record label names, and vinyl pressing numbers with the slightly scary verve of a fanatic. Perhaps because he dances most of his route (but more likely because he seems to cover a vast area of Greenwich and we're at the very end of his schedule) our post doesn't arrive before three o clock and often arrives closer to five. And anything that needs signing or such-like just goes straight back to the post-office - the posties aren't going to tramp those extra minutes to our front-door. 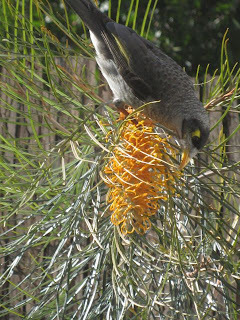 In addition, Noisy Miners have greedy-looking yellow eyes and sharp yellow beaks and make a terrible din. Which is what they were doing now. And amidst all the squawking, there was a sudden great thud which caused the Miners to flee in an instance, piping and flapping as they left. Something had flown straight into our windows, braining itself. It now lay insensible by the front door like a misdirected parcel. 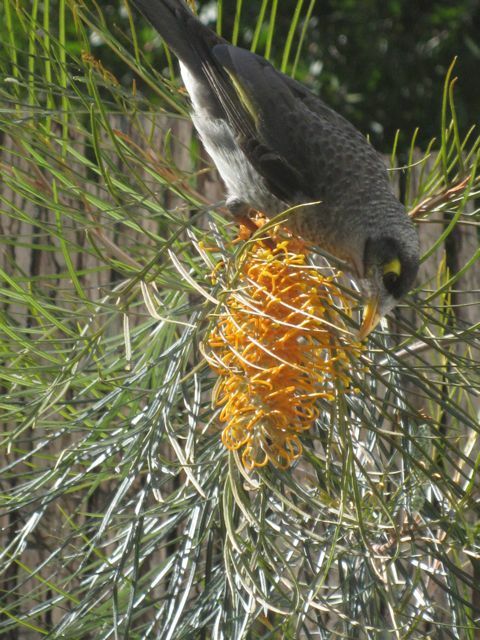 The first thing I realised was that my stunned bird was no Noisy Miner. If it had been, perhaps I could have just ignored it and left it to its fate. However, before me was a bird I had never seen before, in all my bird-watching, binocular-bearing Sydney days. This immediately explained the consternation of the Miners in the first place - something foreign had dared to land in Glenview Street. I unlocked the front door, tried to stop Sniff from feasting upon our feathered friend, and began to ransack the house for a cardboard box because I remembered that stunned birds should be placed in darkness and left to regain their strength. Unfortunately, I had dutifully recycled all our cardboard boxes only a few days before and couldn't find one anywhere except that with all the dog paraphernalia in it. Our bird was going to have to stomach the distinct smell of Sniff I thought as I threw dog treats and dog brushes and dog biscuits here, there and everywhere, knowing that every second counted...I then grabbed the dog towel (in for a penny, in for a pound), lined the box and went back outside to our victim. I gingerly picked it up, admiring its magnificent plumage as I did so. So light, a small fluttering beneath my fingers. It wasn't dead. I thrust him in the box, closed the lid and sighed a huge sigh of relief. Stage One of Rescue Mission accomplished. Now to get him to the vet. 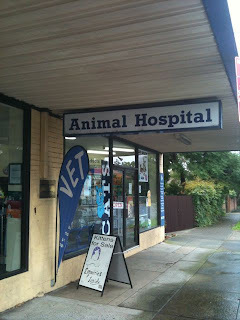 I knew that injured native wildlife are treated for free by any vet so, the dog in tow, we hared off to Sniff's most hated place, the Riverview Animal Hospital, with a rather more precious cargo than groceries in the boot. The vet, interestingly but annoyingly, didn't have a clue what it was. They quickly whisked it off to keep it warm and comfortable and to help ensure that it recovered from its trauma. I have since done my research and think it's an Australasian Pipit. The reason why I've never seen one before is that they normally inhabit open grassland, not creeks and forests. The poor thing was far from home. I had to fill in a form at the vets explaining exactly where I had found the injured bird because, if it were to recover, they would release it at the exact same spot so the bird can then continue its journey onwards, hopefully recognising where it is. I laboriously wrote out specific instructions on how to reach our front door which, as I explained earlier in this entry, is no easy matter. I asked them to let me know how the Pipit fared and bade it farewell. So you can imagine that I was EXTREMELY vexed, after all my efforts that day, to discover a week later, on phoning to find out how the bird was doing, that it had been released accidentally when they were checking up on its progress...In other words, the bloody vet let the thing escape, out into a bewildering unknown landscape. Trying to be optimistic about this, there is a Golf Course round the corner from the Animal Hospital which could fairly be counted as open grassland. I'm hoping our Pipit found it, along with some new Pipit friends, and is starting a new breeding colony on the 18th Hole...But, more likely, it was squished by a lorry on the Pacific Highway as it woozily tried to work out where the hell it was. I can only comfort myself with the thought that I am, after all, at least as good (if not better) in an emergency that the employees of Riverview Animal Hospital. Great story, I've enjoyed reading your blog. 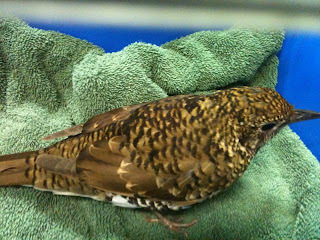 The rescued bird is actually a Bassian Thrush. A very interesting bird to pop up in the inner city, they usually only hang around moist gullies and rainforest.